Living in the 21st largest city in the world and not owning a car requires you to use public transportation or your feet….a lot! The vase amount of people on the road along with their consumption of alcohol, narcotics, or even the fact that there is other people on the road makes it a little scary to ride in a taxi or bus. Along with the fact that taxis will rip you off, not take you where you want to go, have extremely odd odors or they’re very difficult to catch during certain times of the day. Another option is the above or underground trains. These are great, affordable, and reliable! But, like everything, there is a problem…they don’t go everywhere you want to go! Option 3, traveling by foot! It’s a good safe choice, but not the most efficient. Dodging pedestrians, drips of water from the roof tops, lose pieces of cement, the random dog asleep in the middle of the sidewalk, and motorcycles that don’t want to use the road due to lots of traffic. Not to mention the distance of your destination and the time factor. These are all things to consider while traveling in Bangkok! There’s got to be a better way….BIKES! We invested in some used foldable bikes to take care of our transportation woes. Why foldable? 1.) Those great above or underground trains we love to take will only allow you bring on a bike if it’s folded up. 2.) When your plans change and you’re stuck far from home and it’s dark or rainy, you have to take an undesirable taxi and we all know they don’t have bike racks on them. 3.) Storage! Why used? 1.) We’re teachers….need not to explain. 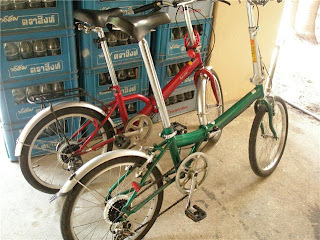 Experiences on a foldable: Bangkok isn’t the cleanest city and their streets aren’t the smoothest. Anywhere we ride; due to traffic and animals (mostly elephants and dogs) we have to deal with puddles of water and potholes. Most of the time, we have to go right through them. 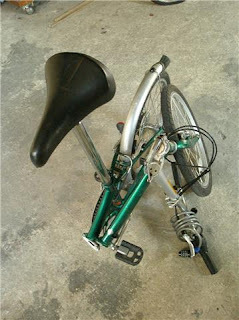 Daniel’s bike has a problem of folding whenever it wants to, not when we want it to. Therefore, on several occasions, Daniel has met death while riding along and the bike starts to fold up. A quick stop and readjustment and he crosses his fingers that it won’t happened again…th at day. Bekah deals with other issues. Since her bike is solid she has more problems with her attire on the bike. Mostly you will find her riding in a skirt and flip flops. Leg positioning and toe curling is essential! There have been high gusts of wind leaving the eyes of Thai men glazed. Then, there are the times when the back of the flip flop gets stuck in the spokes and she’s found her shoe in the middle of an intersection. That’s when she stands along the side of the road waiting to play chicken while multiple cars run over her shoe. Some great times have been spent on these things and we have more to look forward to. You’ll mostly find us riding to the gym or the market, sometimes in bright sun, dusk or often in a rain storm. There will be more adventures on these bikes, please pray for our safety.